Urgent message: Patient histories can be helpful in guiding the examination and raising red flags for possible diagnosis. However, it is essential to resist the urge to accept a patient’s self-diagnosis at face value. A 65-year-old female with a history of metastatic endometrial cancer, COPD, and asthma presented with increasing shortness of breath. Four days prior, the patient had undergone a chest wall port placement for chemotherapy. The patient believed her symptoms were attributable to COPD exacerbation. A chest x-ray was obtained and depicted a large left pneumothorax with associated pleural effusion and a mild rightward mediastinal shift. 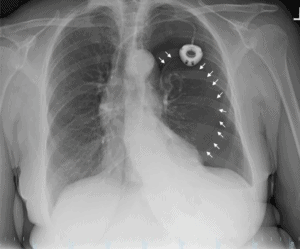 These findings reflected a tension pneumothorax as visualized in Figure 1. The patient was transferred to the emergency room and underwent needle decompression followed by a tube thoracostomy. She was successfully stabilized and has obtained a full recovery as demonstrated by the image in Figure 2. Figure 1. Large left pneumothorax. White arrows demarcate the lining of the left lung. Left-sided infusion port and mild rightward mediastinal shift also evident in the image. Figure 2. Cardiac silhouette and pulmonary vasculature are stable. Interval re-expansion of the left lung. Tension pneumothoraxes develop with the accumulation of air in the pleural space and compression of the lung under the resulting pressure. Typical symptoms and signs of a tension pneumothorax include hypotension, shortness of breath, rapid heart rate, rapid breathing, neck vein distension, dyspnea, and pleuritic chest pain.1,2 Physical findings involve hyper-resonance to percussion, decreased breath sounds on the affected side, and tracheal deviation.1,2 A chest x-ray visualizing radiolucent air and the absence of lung markings is suggestive of a pneumothorax, but tracheal deviation is suggestive of a tension pneumothorax.1,2 With hemodynamic instability as evidenced by hypotension, altered level of consciousness, significant tachypnea or tachycardia, a needle decompression in the second intercostal space, over the rib, should be performed.1,3 Our patient exhibited the majority of these symptoms upon entering the clinic and provides an excellent example of a postprocedural tension pneumothorax, again as seen in Figure 1. Primary care physicians must be actively aware of the potential for postprocedural pneumothoraxes, particularly with patients who complain of dyspnea or shortness of breath. Patients with a history of COPD, bronchiectasis, cystic fibrosis, malignant disease, interstitial lung disease, pneumonia, tuberculosis, Marfan’s, and Ehlers-Danlos, some of which apply to the patient described here, have a heightened predisposition to pneumothorax and must be monitored more extensively for the condition. Providers must secondarily be aware of the possibility of being led astray by patient self-diagnosis and delve further into patient-proclaimed conditions. Urgent care and primary care physicians are the first line for many acute conditions, and so must vigilant for life-threatening diagnoses regardless of the presenting complaint. 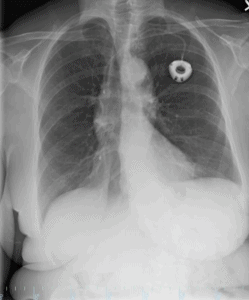 Tension pneumothorax is one such diagnosis with potentially dire consequences. The provider must understand the circumstances in which a pneumothorax can arise, the symptoms involved, and the techniques available to diagnose pneumothorax. Further, urgent care providers must keep in mind that while the patient history can be helpful in guiding the examination and possible diagnoses, we must not accept a patient’s self “diagnosis” at face value but explore other possibilities for common symptoms. Weiser TG. Pneumothorax (tension). Merck Manual Professional Edition. Available at: www.merckmanuals.com/professional/injuries-poisoning/thoracic-trauma/pneumothorax-tension. Accessed January 9, 2019. Roberts DJ, Leigh-Smith S, Faris PD, et al. Clinical presentation of patients with tension pneumothorax: a systematic review. Ann Surg. 2015;261(6):1068-1078. Currie GP, Alluri R, Christie GL, Legge JS. Pneumothorax: an update. Postgrad Med J. 2007;83(981):461-465. Tsotsolis N, Tsirgogianni K, Kioumis I, et al. Pneumothorax as a complication of central venous catheter insertion. Ann Transl Med. 2015;3(3):40. Veenstra DL, Saint S, Saha S, et al. Efficacy of antiseptic-impregnated central venous catheters in preventing catheter-related bloodstream infection: a meta-analysis. JAMA.1999;281(3):261-267. Sznajder JI, Zveibil FR, Bitterman H, et al. Central vein catheterization. Failure and complication rates by three percutaneous approaches. Arch Intern Med1986;146(2):259-261. McGee DC, Gould MK. Preventing complications of central venous catheterization. N Engl J Med.2003;348(12):1123-1133. Merrer J, De Jonghe B, Golliot F, et al. Complications of femoral and subclavian venous catheterization in critically ill patients: a randomized controlled trial. JAMA2001;286(6):700-707. Kusminsky RE. Complications of central venous catheterization. J Am Coll Surg.2007;204(4):681-696. ← Can Urgent Care and Advanced Practice Providers Fill the Void as PCP Numbers Dwindle?